Der Artikel Ludwig van Beethoven (1770-1827): Klaviertrios Vol.4 wurde in den Warenkorb gelegt. Hyperion’s record of the month for November brings us the triumphant final volume in The Florestan Trio’s cycle of Beethoven piano trios. The disc opens with the Piano Trio in C minor, Op 1 No 3, Beethoven’s earliest masterpiece and a work brimming with dark lyric beauty. Radical enough for Haydn – perhaps out of jealousy – to advise against its publication, this work quickly became one of its composer’s most popular chamber works. In both the other works on this disc Beethoven responded to the contemporary fashion for sets of variations on popular themes from operas. The Variations in E flat major, Op 44, are based on the hit number from Carl von Dittersdorf’s ‘The little red cap’, while the last movement of the Piano Trio in B flat major, Op 11, takes as its theme a favourite number from Joseph Weigl’s comic opera ‘Love at sea’. 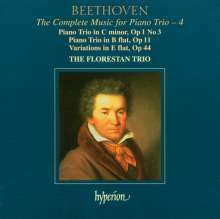 Ever keen to maximize his income, Beethoven switched his original top line from the clarinet to the more popular violin, so creating the charming piano trio we know today. 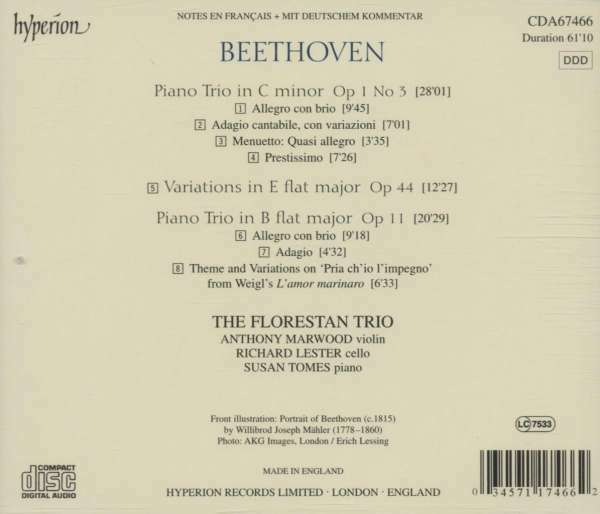 Needless to say, The Florestan Trio is on top form in this new recording.